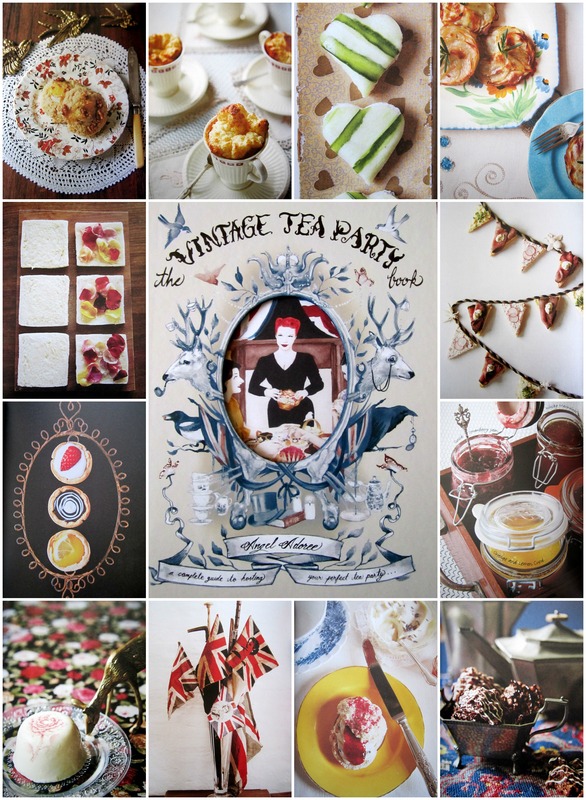 The Novel Bakers Present: The Vintage Tea Party Book! 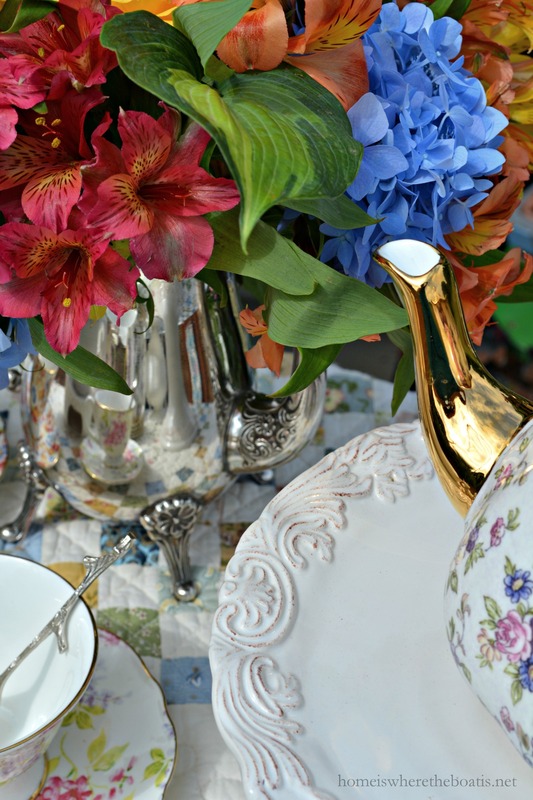 Teatime delights, recipes and inspiration for hosting a vintage tea party! 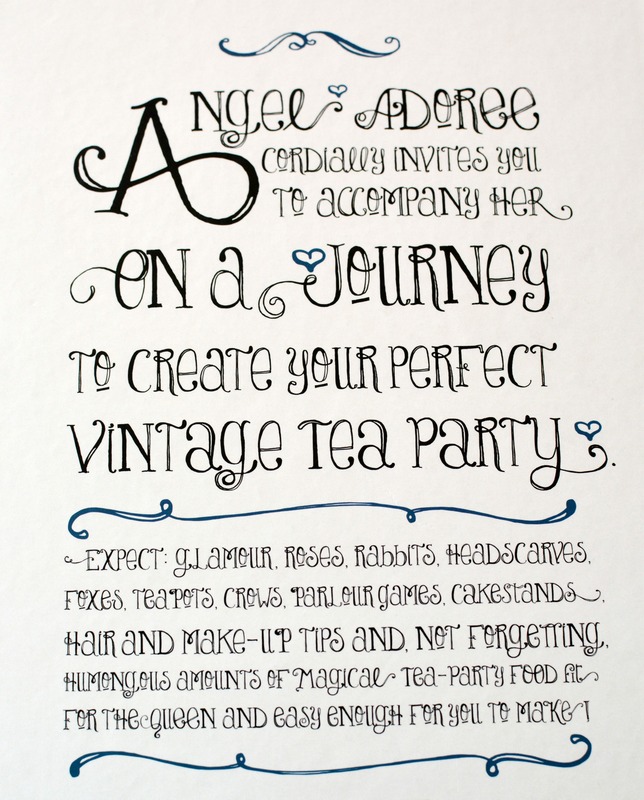 Angel Adoree cordially invites you to accompany her on a journey to create your perfect vintage tea party. 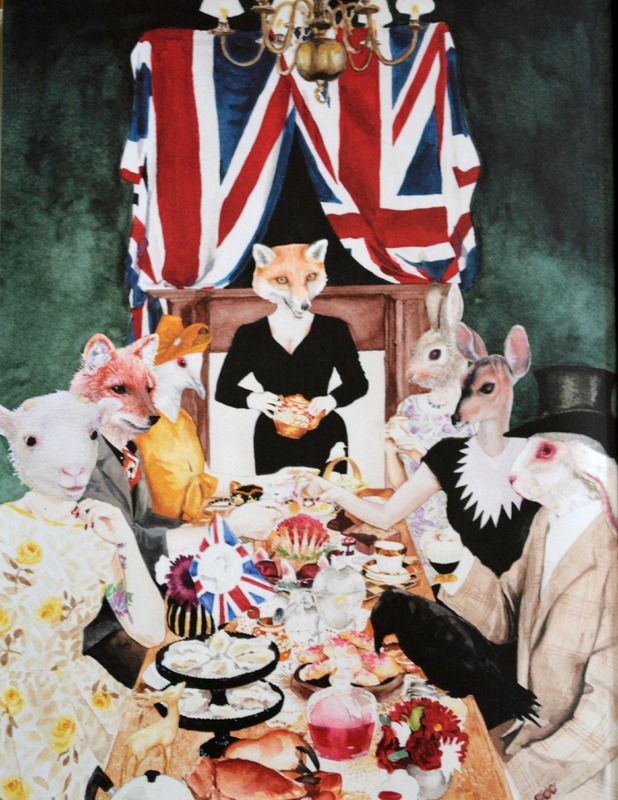 Expect glamour, roses, rabbits, headscarves, foxes, teapots, crows, parlour games, cake stands, hair and make-up tips and, not forgetting, humongous amounts of magical tea party food that is fit for the Queen of England, and easy enough for you to make. 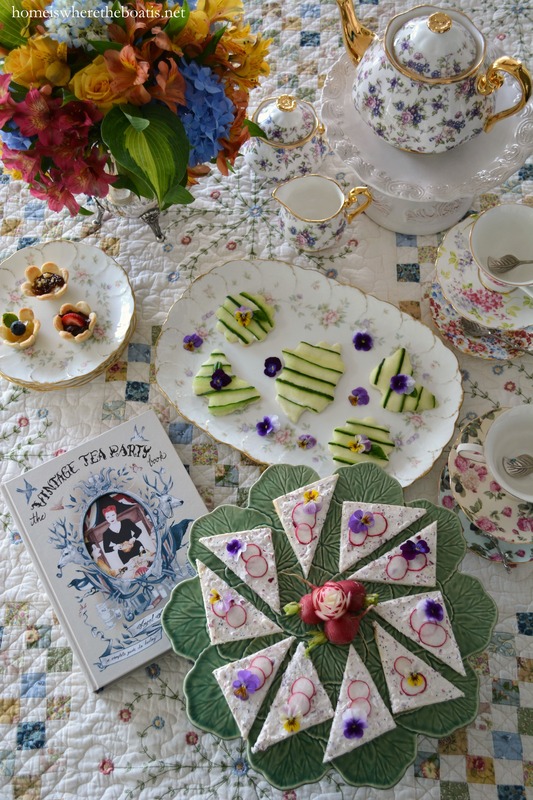 This book is full of whimsy and inspiration for hosting your tea party! From coddled eggs to cocktails, Angel Adoree serves up recipes for Brunch/High Breakfast to Evening Tea, with British flair in vintage fashion. 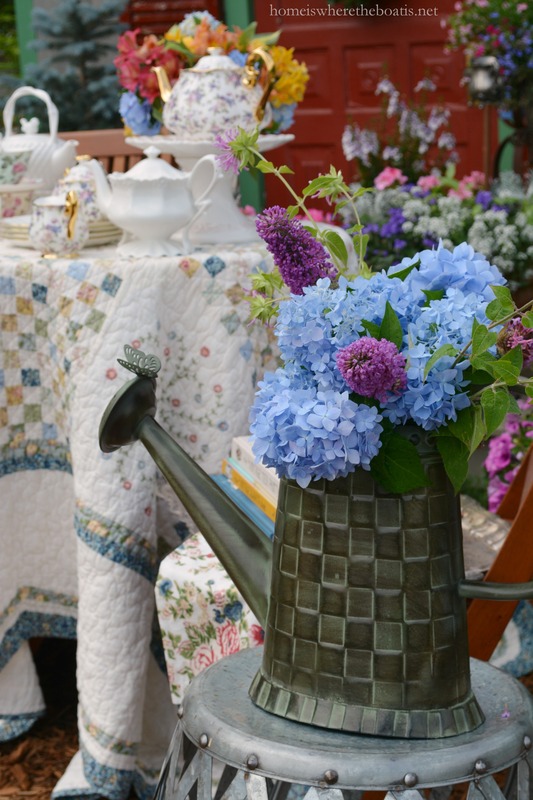 I’m having tea with the bunnies along with a little floral inspiration by my Potting Shed. 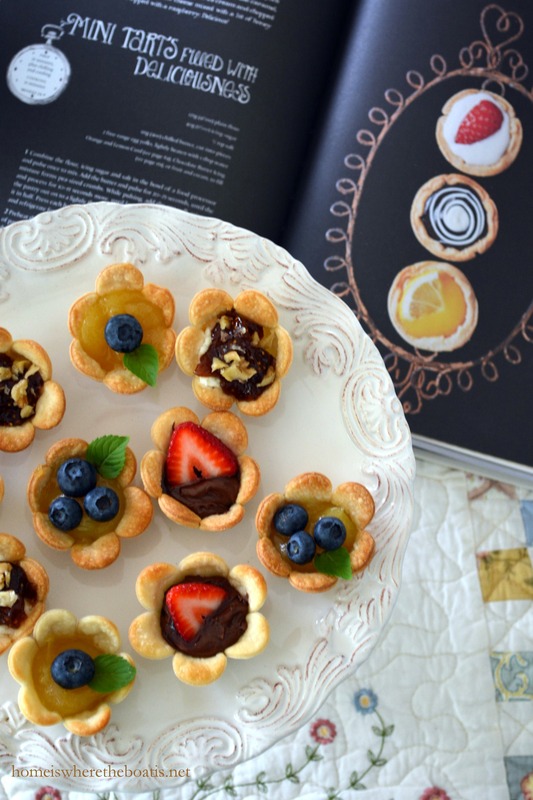 Mini Flower Tarts filled with Deliciousness are easy and fun to make! You can make the floral tart shells in advance, store in an airtight container and serve with an assortment of sweet or savory fillings. These are quick and easy to make with refrigerated pie crust, a cookie cutter and a mini muffin pan. Unroll your pie crust. I used a 3 1/2 inch flower cookie cutter to “grow” 12 flowers per pie crust, re-rolling the pastry scraps. Press pie crust flowers in mini muffin tins. Prick the bottoms of the unbaked shells with a fork. Bake at 425 degrees for about 5-7 minutes until golden brown. Allow to cool in pan 5 – 10 minutes, then carefully remove tartlet shells and place on a wire rack to cool completely. Store in an airtight container until ready to fill and serve. You can dust your flower shells with powdered sugar if you like and then add your assorted fillings. My flower tartlets are blooming with lemon curd and blueberries, Nutella with strawberries and a favorite combination of goat cheese and fig preserves with chopped pecans or walnuts. 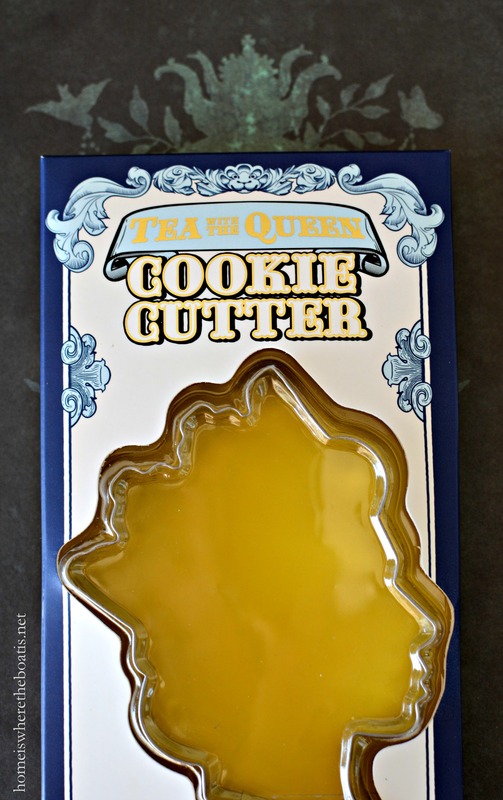 I found a Tea with the Queen cookie cutter at World Market. Instead of cookies, I used it to make some open face cucumber sandwiches. You can make these tea sandwiches in any shape. To start, spread your softened cream cheese on very thin sandwich bread. Using a vegetable peeler or mandoline, make thin slices or strips of an English or hot house cucumber and drain on a paper towels. Layer cucumber strips, slightly overlapping, on top of your cream cheese. 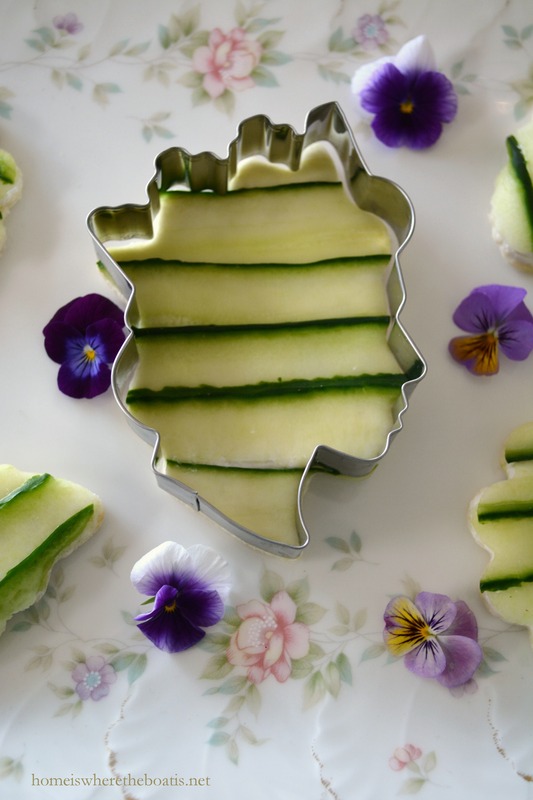 Use a cookie cutter to punch through the cucumber layer and cut your sandwiches into shapes. 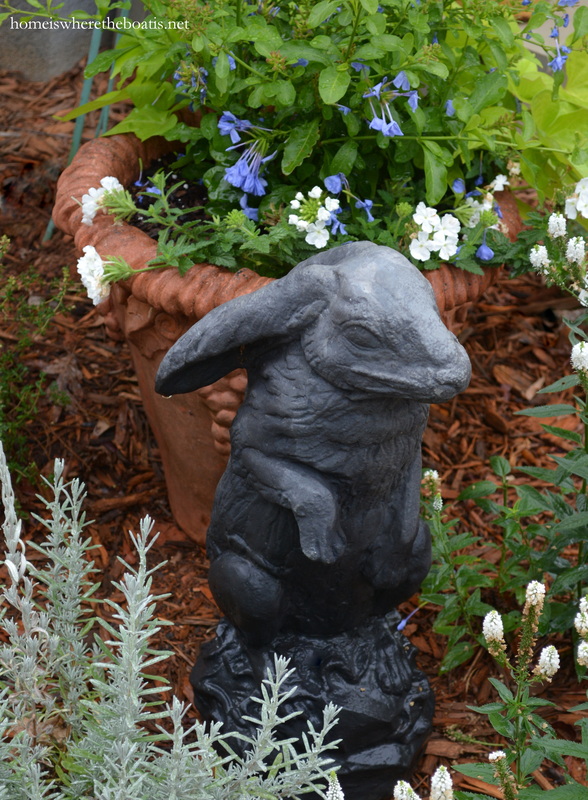 Garnish with parsley or sweet basil leaves or edible flowers if you desire. You can find a step by step tutorial, here. Mince radishes fine and mix with softened cream cheese, 1 teaspoon poppy seeds and a pinch of salt. Mix radishes with cream cheese to the ratio you prefer, depending on the size of your radishes. I used 3 radishes to 4 ounces of cream cheese. Spread your mixture on your sandwich bread, cutting to desired shape, removing crust. Top with additional radish slices and edible flowers if desired. Serve immediately. 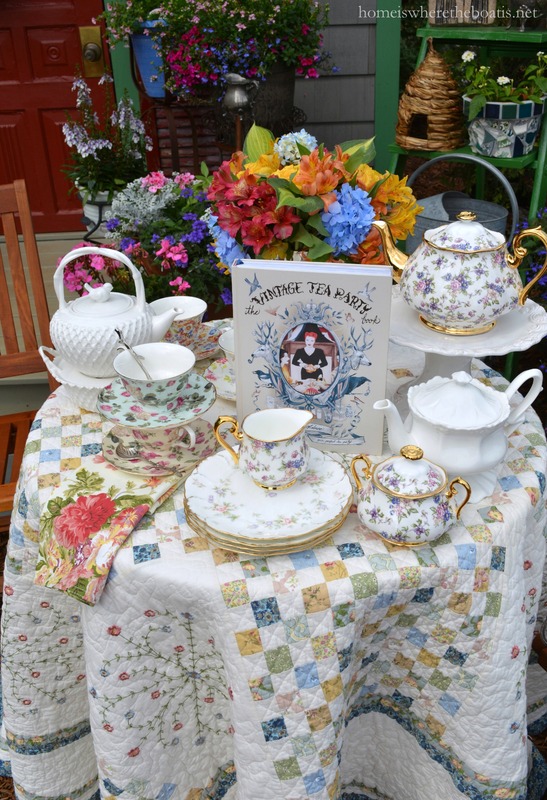 Join us this week with more tea time fun and inspiration on Wednesday and Friday. ← Flag Day: Long May She Wave! You have inspired me once again. Thank you. 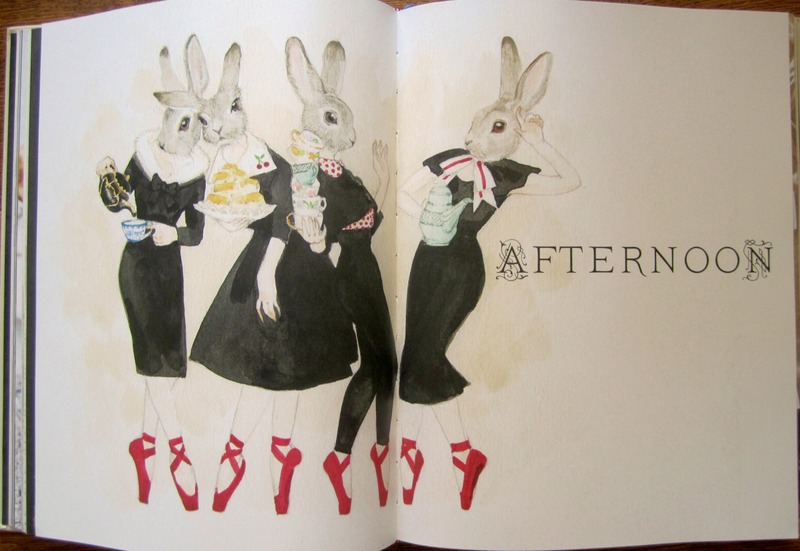 Oh dear me Mary, I’d be there with the bunnies and partying at your pretty tea table by your potting shed. What a beautiful tea you’ve shared with inspiration from the lovely book. 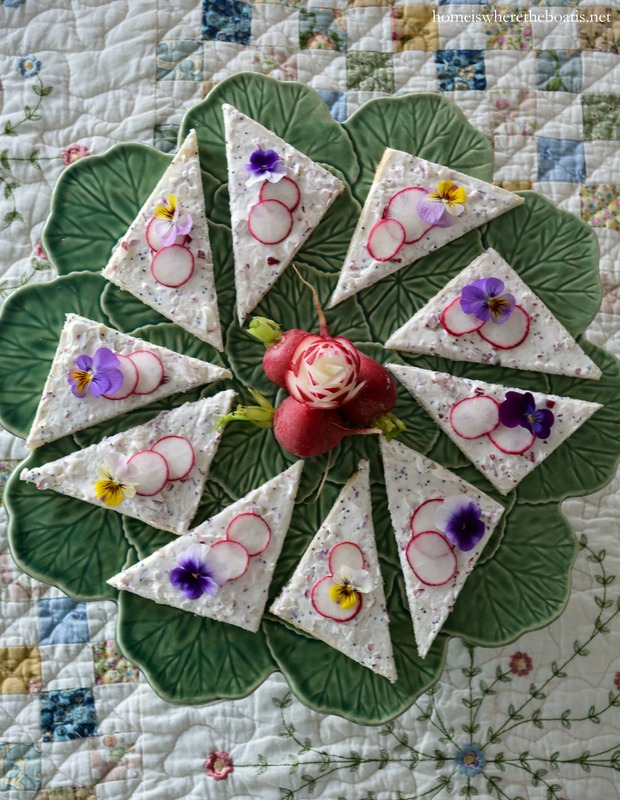 The tarts are adorable, as are the cucumber striped radish sandwiches. Cheers to you as I sip my morning tea, with a smile on my face!! didn’t you just love this series, it allows us to create endlessly! 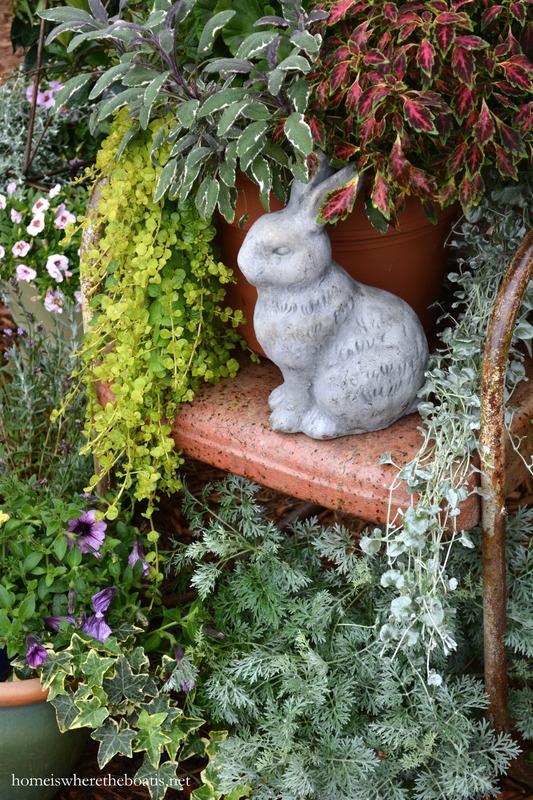 loving a little bunny time in the garden, so cute with the tea pots welcoming the feathered guests too :-) the table is perfection, tucked perfectly into a sweet nook to refresh and restore with a little tea time. wild over your basket weave watering can, cute addition! your tarts are adorable, mine will show up later this week, and lets face it none of my treats look cute like yours, i slapped mine together so quickly my tea party looked like a tornado may have passed through that very second :-( its nice to see what they should have looked like! love the radish rose! impresses at your clean edges on the sandwiches too, i used a pizza cutter! gosh that was delightful, i have all your same goodies coming on friday, its a good thing i put some distance away from properly executed food verses my glop! thanks for a great kick off to the week, it will be fun to spill the tea all week long! I absolutely loved this tea party. I especially love the sandwiches. How far ahead could one make them? My granddaughters love cucumber sandwiches. The radish sandwiches look so glamorous! Mary, as always, everything you present is delightful. Where do you get your ediblle flowers? Hi Betty, I planted the violas. Like all edible flowers you want to make sure they are pesticide free. Someone told me you can find edible flowers at Whole Foods but there’s not one near me. Thanks, Mary. I do have a Whole Foods near me. I will check to see if they have them in stock. Do you use special organic soil and start with seeds when you plant yours? Mary, This Tea Party so so much fun! You are truly amazing! Absolutely beautiful table settings and yummy looking treats! I always enjoy your blog with a cup of morning tea. 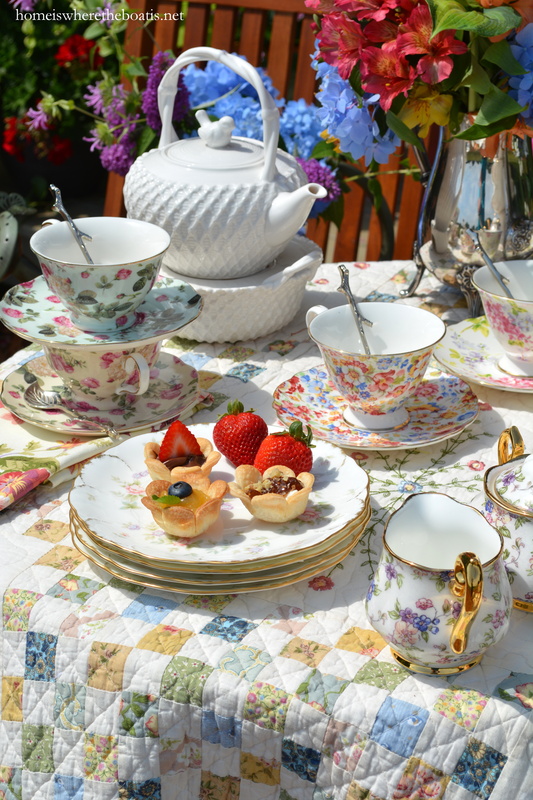 Being British I absolutely loved the tea parties my Gran used to have :) Only criticism, pinkies down please. Pinkies up is considered poor form. Somehow, pinkies up popped up here in the U.S. and has spread like wildfire. P.S. 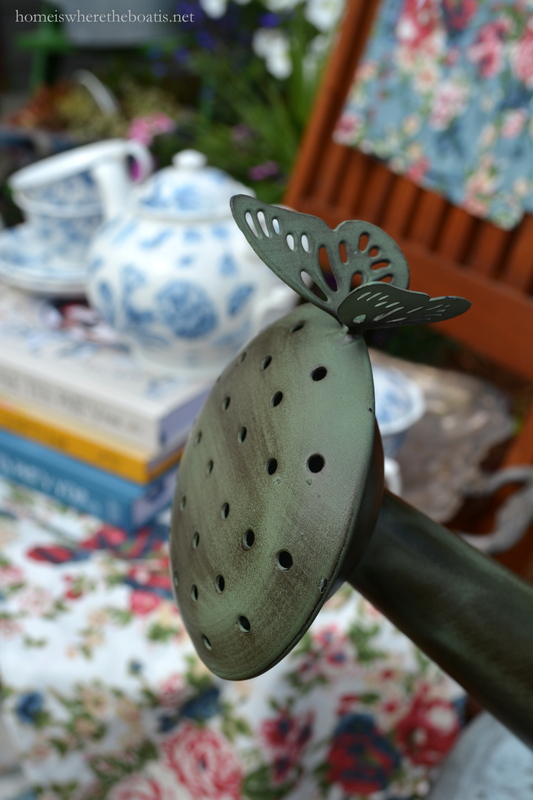 Love your watering can with the butterfly on the spout! This makes me want to become a tea indulger! I love the setting with the tea cups and flowers. 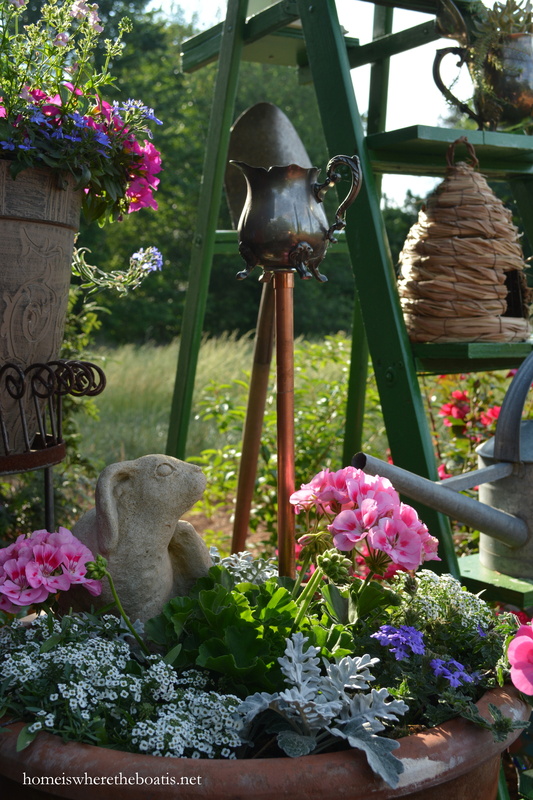 I also love the watering can. Can you tell me where you got it. 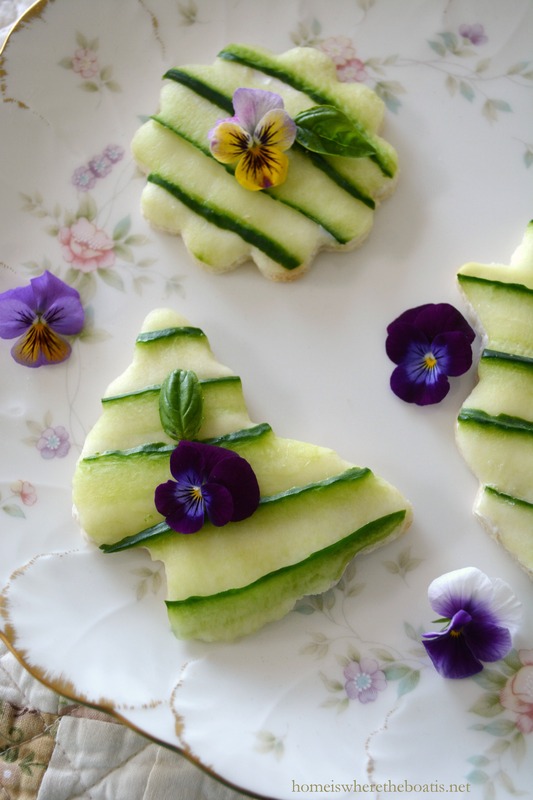 Love it, the cups, the flowers, the green of your garden, and really good idea to cut vegetables in the cookies shape, nice job! 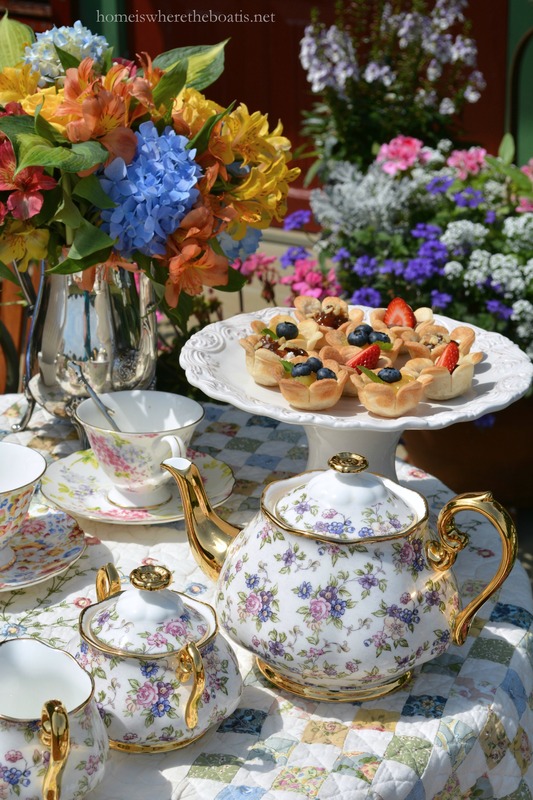 I adore tea parties…yours are always special and I feel privileged to be ‘invited’ to participate by feasting on your blog! 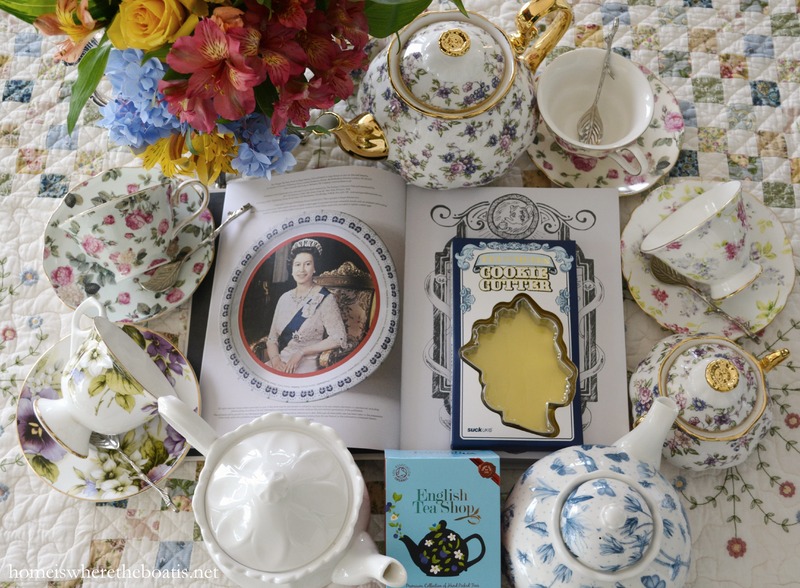 I’ve been asked to do an article about tea parties in Hawaii for a coming issue of one of our magazines and have been in a tizzy about it… Tea Time was brought to the islands with the British after Captain Cook “discovered the islands” and they became the thing to do in the afternoons with the Hawaiian monarchy. 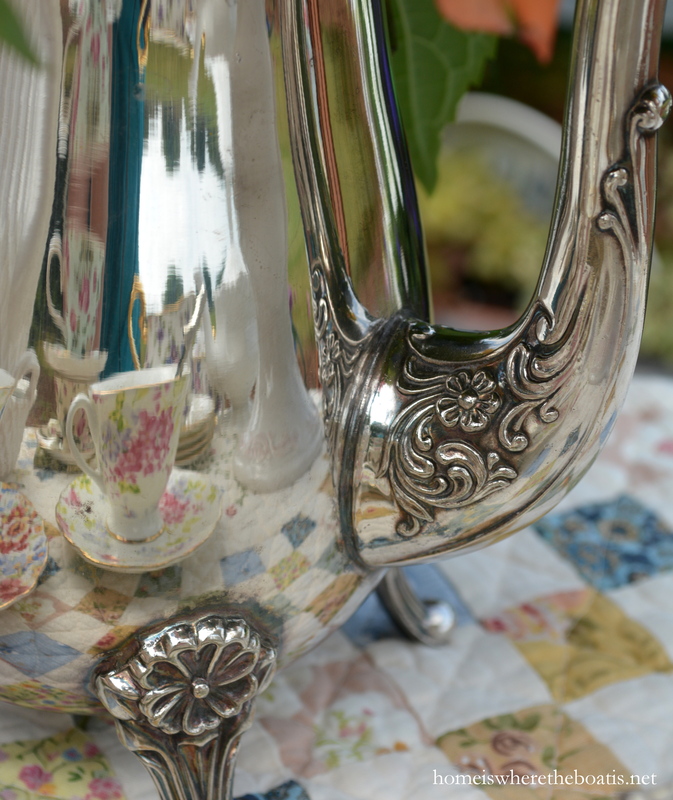 There are still several tea societies who hold tea parties frequently and several hotels that traditionally host afternoon teas..
Mary, Mary, Mary, I dearly loved having tea with you this afternoon! I love your interpretation of the book and recipes. The flowers on your china mirror the flowers in your garden. We could very well be in the West Country, Devon or St. Ives. What a pretty teacup collection! The cucumber sandwiches are the prettiest I’ve ever seen. I bought cukes to try my hand at the recipe…and I lost the cucumbers. Flat out lost them! They’re in the house somewhere, never made it to the fridge. Your radish-topped sandwiches are works of art, and the patchwork quilt is a stunning background. Thank you for the fabulous time–you lightened my soul today! Such a stunning setting and a wonderful tablescape. Love it! What a wonderful Tea Party! You are such a gracious hostess, oh my heavens, every thing is just delightful! Your tablescape….be still my heart! Your photos are soooooooo inspiring ! Hi, Mary! Now this IS my cup of tea! 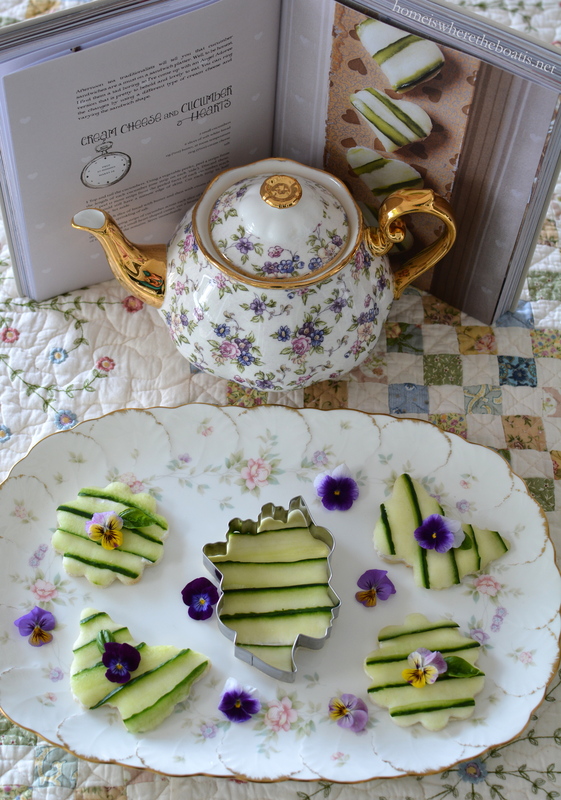 Beautiful presentation, and tempting, tasty recipes….thank you very much for this lovely post. This is beyond a spot of tea, just lovely (wish I was your neighbor)!! 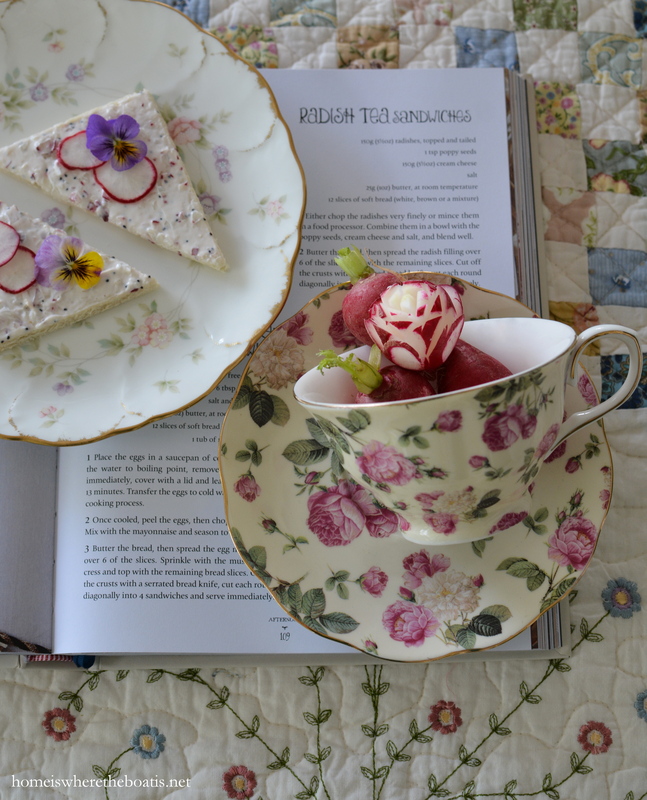 Beautiful tea cup sets, the tarts are adorable., and the tea sandwiches looks yummy. Anything from across the pond(as they say) I love !! I am looking forward to High Tea at the Biltmore with my sister!! I love this book so much that my family bought me Angel Adoree’s other two books. Your post is lovely, and there’s nothing I love more than a traditional English afternoon tea. And of course I love Angel’s unique spin on the tradition. 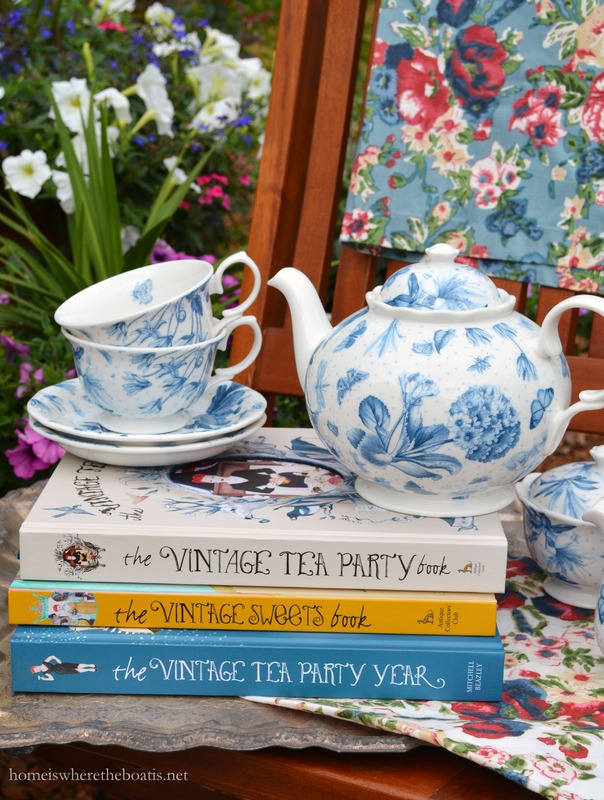 Love this post…..would you believe I also have The Vintage Tea Party Book? I’ve even mentioned it in my blog before. Isn’t it fabulous!!? Every element of your setting is sublime…absolutely gorgeous! Thank you for sharing! You would have to be persnickety indeed, not to find at least ten things to love in this post! I love all the pretty teacups. I’d like to have tea in each of them, a different one each day until . . . until. 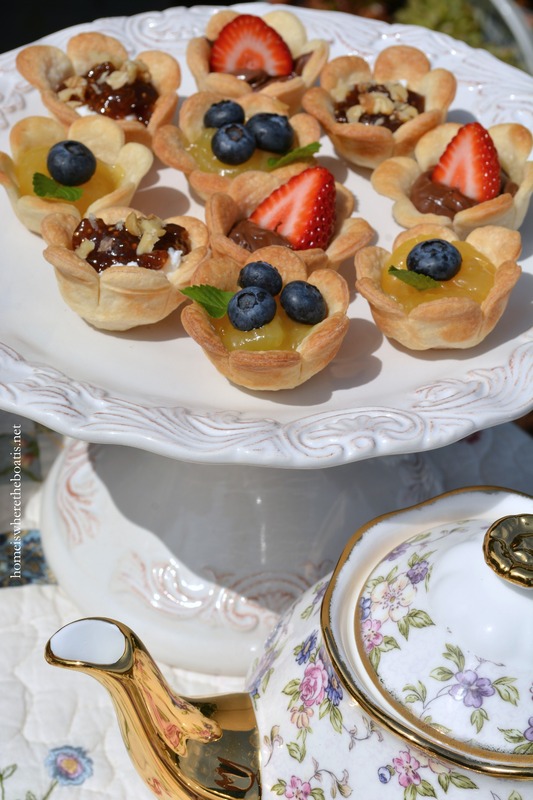 Those little flower tartlets are so adorable, and just the right size to pop into your mouth! The quilt, the bunnies, your flowers . . . Everything is just beautiful! 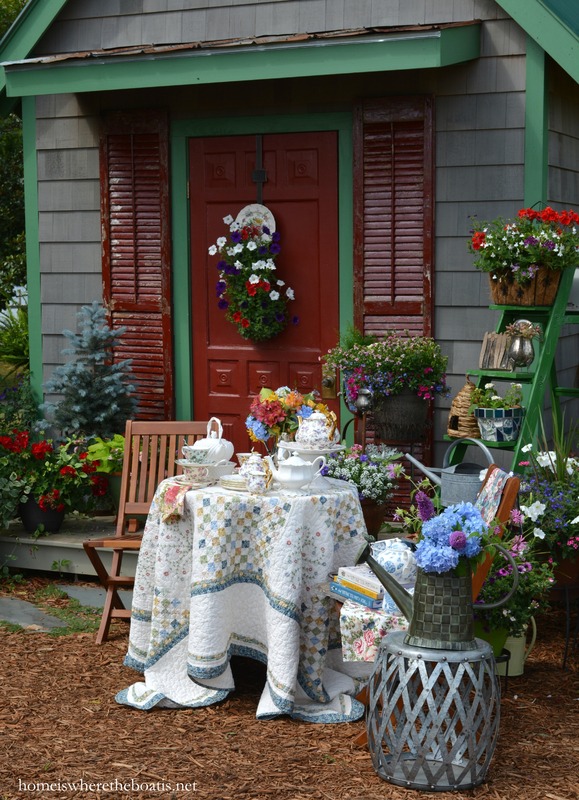 I just love everything about this tea party! OMGosh how beautiful a setting! I love your attention to detail too. The absolute perfect tea party! Beautiful table, as always, perfect for the theme. Love your quilt! Be still my heart! You knew I would fall for this post Mary! What a beauty! It is featured today at Home Sweet Home! Lovely idea! Found your site only because someone had posted one of your photos in a collectors group that I’m in as her own photo. Was concerned about copyright issues. Beautiful photos and displays. Hi Suzanne, Can you tell me where the photo is posted? People have blatant disregard for copyright and my photos are hijacked constantly. Amazon, the link is highlighted.